Wyoming...a great place for business! Yesterday I spent the day with attending the Wyoming Rural Development Council's (WRDC) Community Assessment training in Cheyenne. I usually attend these events as a fly on the wall, shooting video and photos and picking up as much information about the subject as I can, but in this case, I was part of the story. 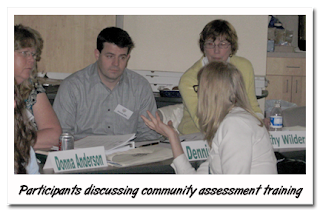 WRDC’s Community Assessment training is for anyone and everyone interested in stepping up and volunteering to help Wyoming towns create locally-conceived and locally-driven development strategies to improve their communities. 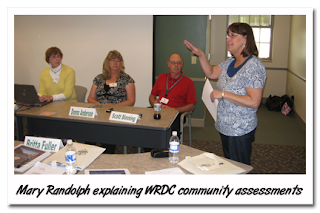 Wyoming Rural Development Council Executive Director Mary Randolph and WRDC Senior Rural Development Specialist Jo Ferguson presented to about 15 community members yesterday in a recruitment push to fill future community assessment resource teams. 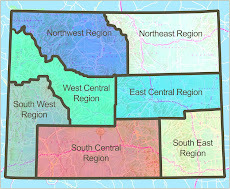 The purpose of these teams is to secure a diverse collection of experts in community and economic development to help rural communities discuss, plan and implement strategies that will improve their towns according to their resident's vision. After individuals train, they are chosen to be on specific teams deployed to specific towns to hold three-day pow wows with community leaders and concerned citizens to nail down the major goals of the town and develop strategies to get there. According to Randolph, the program has trained more than 500 volunteers and has assessed nearly every incorporated town in Wyoming. The training provided a good chance to learn more about the WRDC, its mission and its impact on our state. I highly suggest anyone who is civically minded attend one of these sessions. The Wyoming Business Council works to grow Wyoming's economy. Follow along to learn about business tools, entrepreneurship, and economic resources for Wyoming communities. Brought to you by the WBC team. Just who is our staff? Check us out here. Pat Robbins: South Central Wyo. Roger Bower: West Central Wyo. Steve Elledge: East Central Wyo. Interested in Moving Your Business to Wyoming? Looking for a Christmas tree in the Medicine Bow National Forest. What do you want entrepreneurs?